Saab 9-3 Vector Sport gets feisty diesel | What Car? 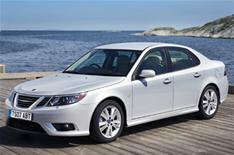 Saab 9-3 Vector Sport buyers will now have the option of a 1.9-litre diesel engine. The 176bhp engine has 295lb ft of pulling power, emits 149g/km of carbon dioxide and does 50.4mpg on average. The engine was previously only available in top-of-the-range Aero models. Prices for the 1.9 TTiD 180 Vector Sport begin at 25,315.